I recently posted a cartoon called the 'Corporate Twitter Dilemma', which (I think) nicely sums up the issues around using Twitter as part of an official marketing / customer strategy. However, Twitter is changing and starting to become more accessible. Next week the Twitter homepage is rumoured to be changing to help understand more about the service and how to use it. Twitter are also working hard to help marketers understand more about the potential of the platform. The first sign was the launch of 'Twitter 101 for Business'. The Twitter 101 Case Studies are in depth looks at some of the most talked about (and successful) examples of corporate Twitter use including Dell, JetBlue, Teusner Wines, Current, Etsy, Tasti D Lite, CoffeGroundz, NKEDPizza, American Apparel and Pepsi. 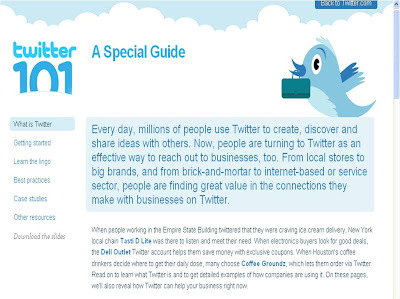 Download the 'Twitter 101 for Business Special Guide' in pdf format here. Thanks for this. Great find. Doing business is not a rocket science, but maintaining business profitability is an important factor in any business. I will maintain my business profitability with online business and search engine optimization a supplement to it.